Social media marketing is the utilization of social media platforms to promote services and products. Social networking gives your business a lot of opportunities to reach a big audience in a short span of time. 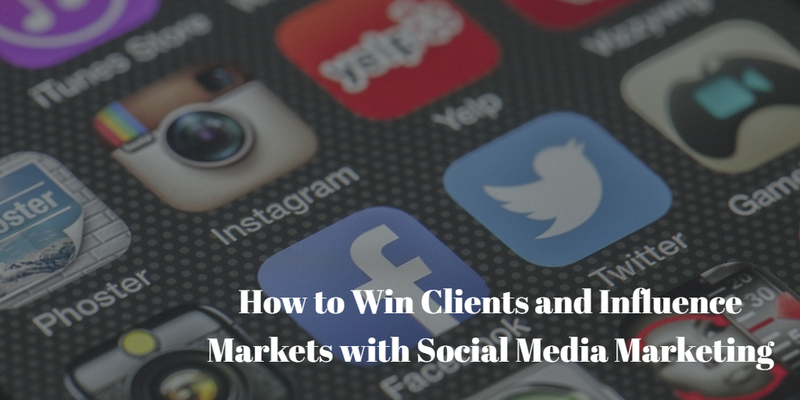 With this social media availability, you are given a chance to utilize it to attract and win ideally matched clients. To make social media valuable, there should be a clear understanding of your purpose and goals. Take time to focus on building a relationship that will influence and increase your engagement. Be a better source of information to them, and don’t jump too abruptly into the sales aspect without creating a good relationship. Ensure to know what strategy would work for your business and how to take action to attract clients. Check out the list of opportunities and determine which ones could win your clients and help your business through social media marketing. In business, having a portfolio will showcase your expertise. Your portfolio should be clear in indicating what you are offering. This will establish credibility in your business. Be clear and confident about what you have to offer. Answering questions from prospective clients about your business is a sure way of making yourself an expert, provided you know the answers. If a business is suffering from a very low engagement, it could be due to the inability to identify ideal customers. Know your target audience’s likes and dislikes. Assess their concerns and problems. This way, you’ll target the right client. By using social media marketing, you can also increase prospective client’s connection by actively engaging in their social media groups. Through interaction, you’ll create a good relationship. But keep in mind that that the quality of the prospective clients is more important than the sheer numbers–quality over quantity. One of the social media marketing tactics is by creating significant contents. Ensure every content is appropriately promoted. Grab your client’s attention by writing a click-worthy title, and add a clear, relevant image to attract interest. Take advantage of some social media features that are designed to assist you in boosting traffic like Facebook Insights. Don’t create a social media account without putting your heart in it. Focus on where your clients are spending most of their time online. Concentrate on the social media platform where you have the chance to engage with a more prospective audience. This could maximize your social media marketing where you can design a plan to increase engagement. Optimize social platforms ads where you can choose your intended action or chosen demographics. It’s better to become a master of one or two platforms than struggle in many. In order to sustain success in social media marketing, you need to focus on how to be a person of influence. Building influence is a long-term investment. It doesn’t happen overnight; it will take a lot of hard work and perseverance. You can only survive the constantly evolving social media if you have a strong foundation as a person of influence. Focus first on what you can give. Offer a brief advice from your experience to someone who needs one. You have to genuinely invest time to support those within your network to build a solid foundation. This way, you’ll create a follower to become a loyal client. You don’t have to be well-known to attract high-quality joint venture partners. The sky is the limit in finding the right venture. Not every relationship will achieve positive results. Hence, you need a plan to reach out and be patient in communicating. The opportunities are still vast in this fast-changing social media era. The basis of social media marketing is to build a good relationship with your prospective clients. In order to keep the relationship, the most important components are value, trust, and credibility. As you provide more value, you increase your credibility, thus, earn trust from your clients. Keeping these proven strategies on hand will guarantee your success to win ideal clients in the years to come. Jessica T. Winder understands the essence of making excellent content that suits the needs of every business, especially when it comes to online marketing. She can spice up your marketing campaign with the content she creates and then incorporates Buy Real Marketing services.